Home Why Choose Element ID? Our patents, products, and accomplishments in the automatic identification industry prove that we are leaders in developing innovative solutions that improve customer profitability and efficiency. We do it at a better price than our competitors because we develop our own embedded software and manufacture many of the products we sell. Unlike our competitors, our software will get the data you need directly into your existing ERP system. 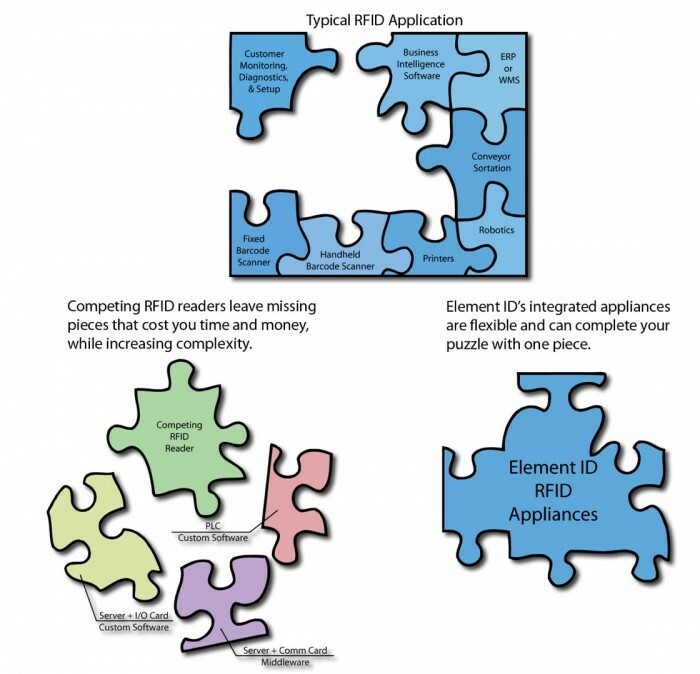 A good solution should never be about data entry tools vs. RFID vs. barcode. They all have their place and the best solutions we offer are hybrids. Our competitors typically have only one of the three and try to fit your application into one of those categories. Choosing Element ID for your RFID hardware needs will save you money. Our technology will reduce traffic on your network and offers performance advantages compared to competing products. Mr. Romaine brings a strong mix of managerial, financial, and technical skills to Element ID. He has over ten years of electronics industry operations experience in industrial automation and headed the RFID development at Accu-Sort Systems from roughly 1998-2000. He currently holds four patents and has been published by SPIE. Immediately prior to starting Element ID, Mr. Romaine spent six years working as a sell-side financial analyst on Wall Street. He holds the Chartered Financial Analyst designation and was Bloomberg Markets Magazine’s Top Semiconductor Analyst of 2003, as well as a frequent guest on CNBC, Bloomberg Television, and Bloomberg Radio. He received a BSEE, MSEE, and an MBA – Finance from Lehigh University. Mr. Martin brings extensive technology experience to the company. He has over 15 years of software and electronic systems design experience in the industrial automation industry (mostly at Accu-Sort Systems). He received RF training and an additional six years of experience from the US Navy. He has six years of engineering team management experience and holds five U.S. patents. Mr. Martin received a BSEE from The College of New Jersey.